Bashar al-Assad is pictured here with his country's flag in the background. 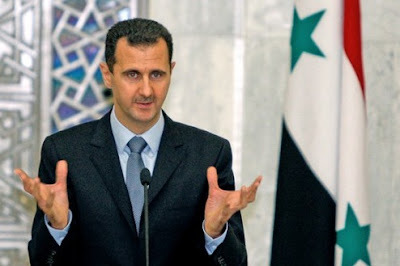 The Syrian "Leader" is displaying an highly unusual body language for a head-of-state. Notice his arm configuration. When elbows are held in so closely to the sides of the chest - it's very characteristic of a low-confidence emotional tone. Alpha's don't hold their arms this way. Those who used to be Alpha's, and those with Beta personalities - well that's a different story. The Syrian President's confidence is crumbling.